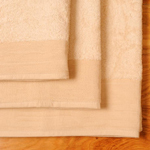 Here at Market Royale we sell Environmentally Friendly Bamboo Towels, Bath Robes and Bathmats. Bamboo fibre is the new softer, natural, greener, renewable and eco friendly material of the 21st century. However, we know you our Customers want choice so in addition to Towels, Robes and Bathmats made from Bamboo, we also offer products made from Organic Cotton and Cotton. We will give you the facts and fantastic offers and you can make an informed choice. Thank you for visiting our website and thank you for doing your bit to help save our environment.